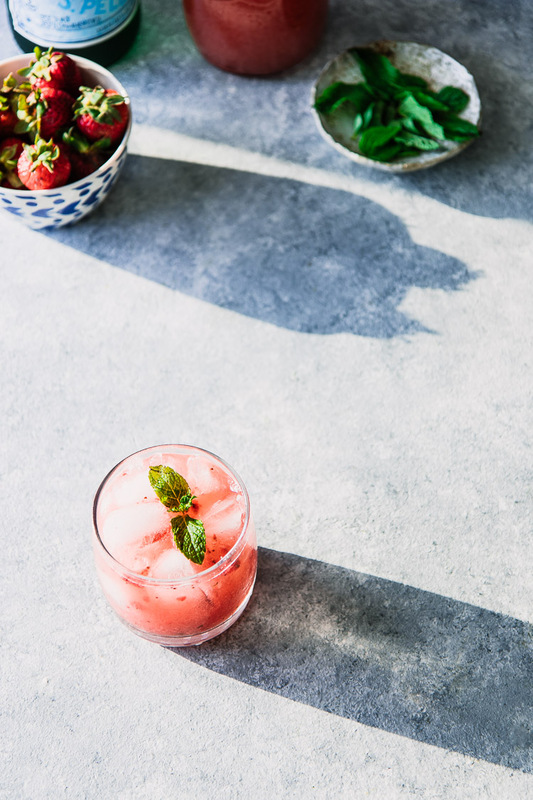 Strawberry Mint Spritzer, a simple water spritz recipe featuring summer strawberry puree and fresh mint leaves. Made with or without alcohol, this bubbly beverage is a warm weather favorite. Who doesn’t love a cold fizzy drink on a hot summer afternoon? There is nothing like a chilled bubbly beverage to cool off in warm weather, especially when that beverage is a homemade fruit spritzer water. With the sparkling water craze at its peak, I decided to recreate my favorite afternoon refreshing drink by making my own homemade fruit spritzer water. Made with sparkling mineral water, seasonal fruit, and fresh herbs, fruit spritzer waters are the perfect summer chillers. 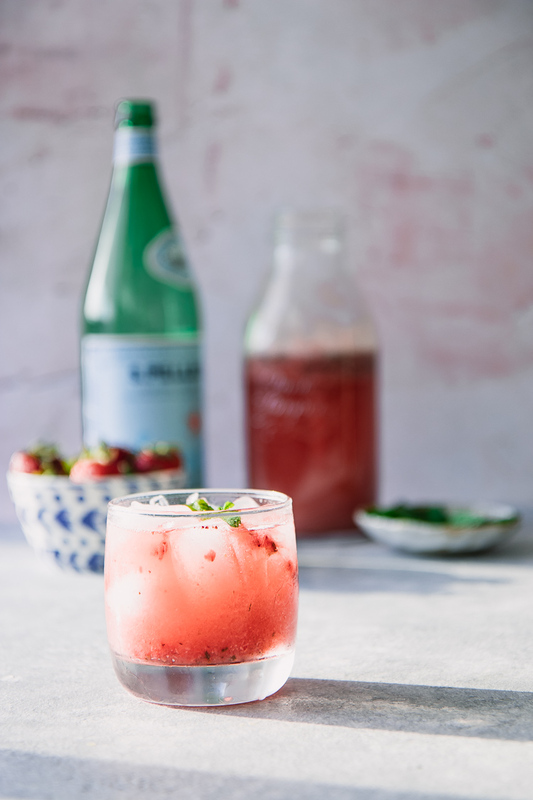 Let’s make your new favorite sparkling soda water, the Strawberry Mint Spritzer! What is a water spritzer? A spritzer, sometimes referred to as a “spritz,” is a chilled drink made with sparkling mineral or soda water. Oftentimes a spritzer will refer to a wine spritzer, which is a cocktail made with white wine and sparkling water. However, the term can also be used for any chilled bubbly drink made from sparkling beverages, whether they have alcohol or not. A water spritzer is a drink made from sparkling mineral water and is typically flavored with fresh fruit and herbs. Preparing spritzers with fresh, in-season fruit is the perfect way to add flavor without adding sweeteners and artificial flavors. The best way to flavor spritzers is to make a fruit puree from scratch using fresh seasonal fruit and herbs. 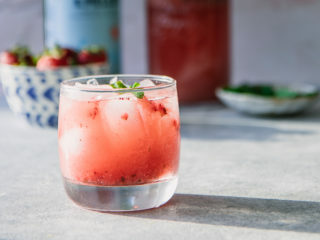 While this Strawberry Mint Spritzer water recipe is non-alcoholic, it would be easy to make this drink a cocktail by adding your favorite spirit. Just add a one ounce pour of vodka, tequila, gin, or bourbon to spike your spritzer. A spritzer is a simple drink that does not require much in the way of kitchen tools, however there are a few simple pieces I like to have on hand that make preparing spritzers much easier. First, I use and love my citrus press for squeezing fresh fruit, and a mixology spoon to stir tall drinks. If you make cocktails and beverages at home often, I also suggest having a full mixology set for shaking, stirring, and muddling. Craving more fresh cocktail and mocktail recipes? Check out our Spicy Grapefruit Margarita and Boozy Blackberry Lemonade recipes, both are great summer drinks that can easily be made with or without alcohol. 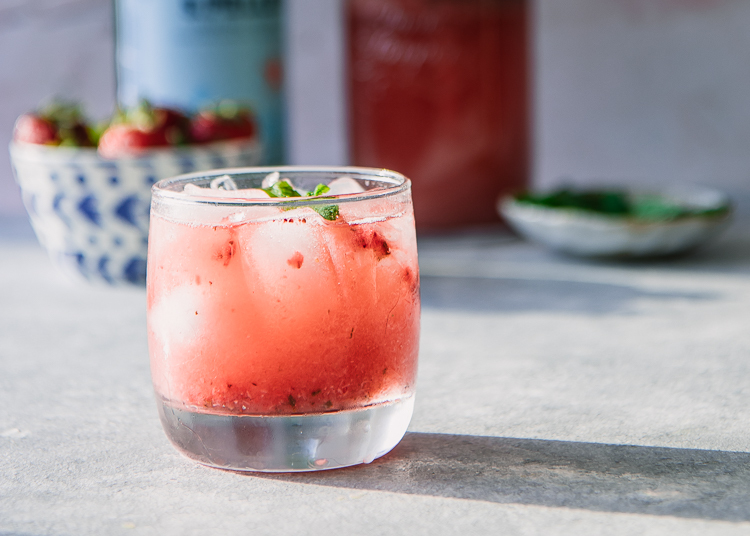 Did you make this Strawberry Mint Spritz? Leave a comment below and rate the recipe to let us know how it turned out. Save this recipe for later by pinning to your favorite Pinterest board and make sure to tag me on Instagram to show me your summer spritz creations. 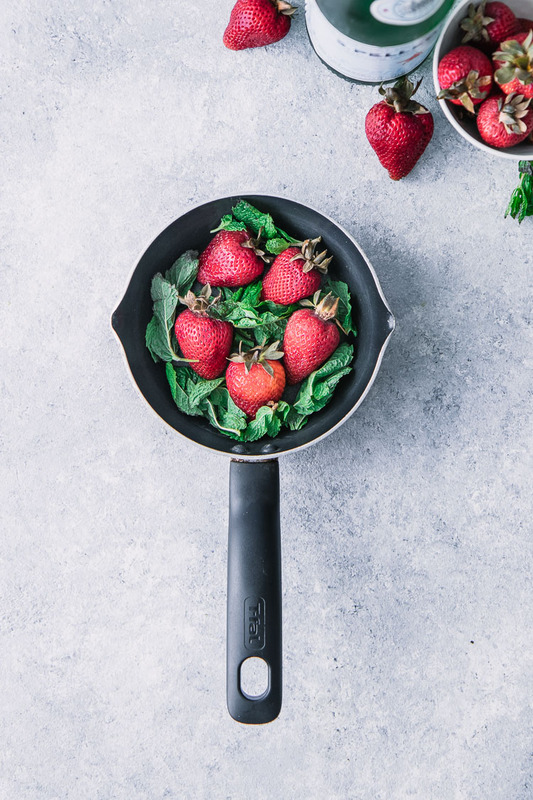 Combine strawberries, mint, and sweetener (if using) in a small saucepan. Heat slowly over medium-low heat until strawberries turn into a puree and mint releases its oils and becomes fragrant, about 10 minutes. Remove puree from heat and let cool five minutes, then add to a blender or food processor and pulse until smooth. Pour 8 ounces sparkling water into glass. Add 1-2 tablespoon strawberry mint puree to glass and stir slowly with a spoon. Add ice, top with mint as a garnish, and enjoy! Build spritzer with sparkling water first, then stir in puree slowly so the water does not foam and overflow. Add the puree first and then the sparkling water will likely cause the water to overflow from glass (we tried it both ways and it worked better by adding sparkling water first). DO NOT SHAKE IN A COCKTAIL SHAKER, unless you want a foamy mess all over your kitchen. Fruit puree can be made ahead of time and added to sparkling water when ready to serve. Leftovers & Storage: Because sparkling water loses its effervescence quickly, we recommend making puree ahead of time but not mixing until ready to serve. Fruit puree can be stored in the refrigerator for up to one week and can be frozen for up to one month and then thawed before use. Nutrition: This summer spritz recipe is very low in calories, had no added sugar, and is a great alternative to plain water and artificially flavored drinks. The nutrition information below was calculated without added sweetener, however if you do decide to add a natural sweetener the additional sugar would be minimal for the amount of puree actually used in each glass. This recipe is perfect because I am a certified La Croix addict! I never thought to put fresh fruit in plain sparkling water, I’ll definitely try this because it’s probably cheaper as well. I’m the same! However right now it’s Perrier ;). I hope you enjoy, the possibilities are endless for creating fresh fruit-based homemade sparkling waters.